Watches are an important, personal accessory that people wear every day. Whether it’s a Timex or a Rolex, we’ll repair it good as new. We specialize in consignment and estate pieces, offering reasonable prices on jewelry, gemstones, and precious metals. Even in the digital age, mechanical clocks remain a timeless staple to most homes. We offer maintenance and repairs for any clock. Timeless Jewelry & Clocks is a locally owned, full-service jewelry sales and repair shop. We are located on Shoreline Drive, nestled between lake Minnetonka and the surrounding lakes. We have expertise on everything from gold and fine metals, to gemstones, clock mechanics, and watch batteries. Our in-house Horologist is one of the best around. 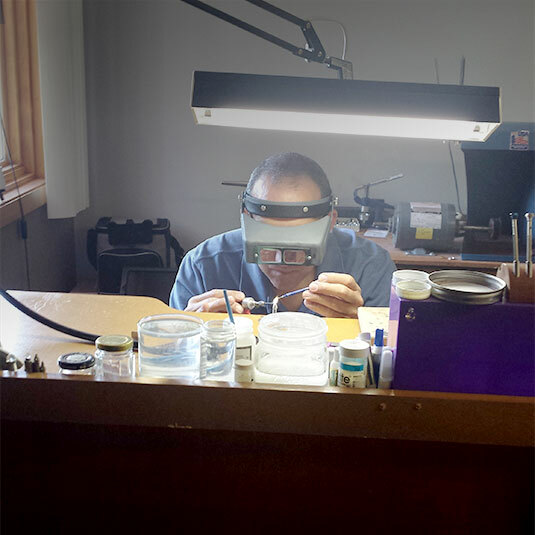 The watchmaker has over 30 years of experience. We specialize in jewelry design, estate/consignment jewelry sales and jewelry appraisals. Come to Timeless today for honest, high-quality, in-house workmanship on all pieces. I have been lucky enough to work with Troy and Debbie in recent years seeking their expertise with purchasing jewelry, re-designing vintage jewelry and jewelry repair. They offer suggestions while taking an utmost interest in what styles I like, listen to my preferences and are very knowledgeable... I continue to look forward to working with them in the future. I have been collecting pocket watches for years. Mainly buying at auctions and storing. Over the past couple of years I decided to have some repaired to understand the value. John is extremely knowledgeable and can fix any old watch, if parts are available. I appreciate his expertise and honesty. I had John do a house call to service 6 clocks in my home. He knew within minutes of listening to them what was wrong. I highly recommend him. The price was very reasonable. I’m glad to have found Timeless Jewelry & Clocks. They are all very professional. I just received my ring that has been repaired and reset with a new fire opal. The work is amazing! I could not be more pleased. Troy does extraordinary work... Thank you. Timeless Jewelry and Clock LLC was exactly what I had been searching for. Their team is remarkable! Walking in I was made to feel comfortable and inquiring further they provided me with everything I was looking for... I am a customer for life! © 2017 Timeless Jewelry & Clocks, LLC. All rights reserved.